People from all over the world rallied in Hong Kong’s North Point on Dec. 7 to commemorate the 10th anniversary of the book Nine Commentaries on the Communist Party. Today, over 180 million Chinese people have declared that they renounce the CCP and its affiliated organizations. The Nine Commentaries offers a comprehensive in-depth analysis of the CCP’s deception, violence, and cult-like nature from different aspects including history, politics, economics, and culture. The book combines historical evidence with insight into the methods the CCP has used to rule. It also describes the CCP’s brutal persecution of the Falun Gong spiritual practice. The organizer of the rally believes that the CCP is bound to dissolve, the persecution of Falun Gong will end, and CCP officials will be brought to justice. Guo added that the core values of the Communist Party are the result of hatred and struggle based on extreme selfishness, yet the CCP often deceives people in the name of love. “Communists hate the democratic system, but they deceive people in the name of patriotism. 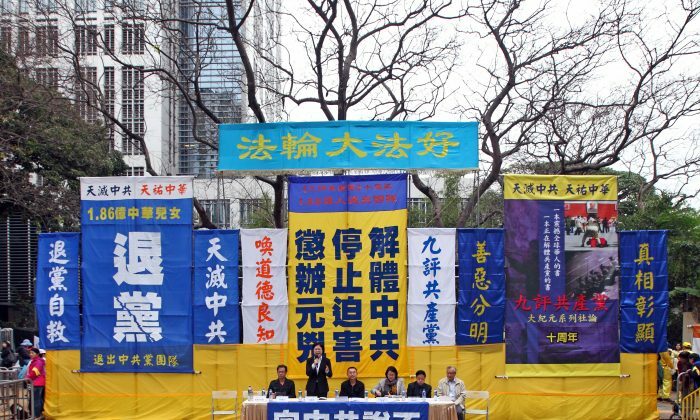 The CCP hates Falun Gong, and it set up a front group called the ‘Youth Care Association’ in Hong Kong to attack Falun Gong demonstrators on the streets. The name of the association appears to show love and care, but in fact, it’s all hatred,” Guo said. “All the organizations, groups, and media manipulated by the CCP spread rumors, deprave Hong Kong’s traditional moral values, and force people to give up the ethical concepts and core values of Hong Kong as well as the conscience and righteousness one should uphold in front of violence and benefits,” Guo said. She said that due to deceptive tactics and the changing position of the CCP, society in China and Hong Kong is in the worst and most complicated circumstances for distinguishing good from evil. The most important contribution of the Nine Commentaries, Guo believes, is to reveal that the core values of the Communist Party are hatred, violence, and deceit. Many Hong Kong politicians also came to the rally, including Democratic Party legislator Wu Chi-wai. Wu praised the Nine Commentaries for the contribution it has made in the past decade. “We need to have more people awaken, to force this evil regime in its governance to face the people eventually. Only by facing the people will the Communist Party possibly and ultimately disintegrate,” Wu said. Legislative Councilors Lee Cheuk-yan and Leung Yiu-chung spoke through recordings. Lee said that the CCP is disintegrating from within, and that the recent Umbrella Movement for democracy in Hong Kong shows that only by ending the CCP’s dictatorship will Hong Kong people have genuine democratic elections and be released from fear. “If your words are not allowed by the Communist Party, then your home could be raided and property confiscated at any time. So under the one-party dictatorship, the people have to live in fear,” Lee said. “How can one have dignity when living in fear? So I hope everyone can work together to get back the freedom and democracy we deserve,” Lee added. Leung Yiu-chung said that the number of people who have renounced the CCP shows that abandoning the CCP is the people’s will. “The Chinese Communist regime is really unpopular in many cases and is contrary to the intention of the people. The corruption is very serious, so many people left China because of it,” Leung said. “At the same time, I think more importantly, the regime has done a lot of inhuman things such as organ harvesting and arresting dissidents. These problems still continue,” he said. Leung admired the Nine Commentaries for exposing the CCP’s crimes.